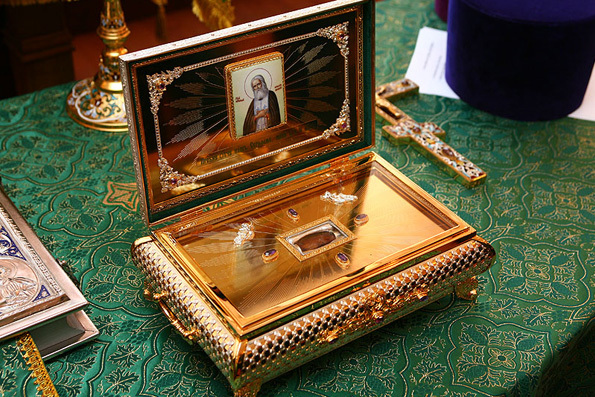 London, June 15, Interfax – Relics of St. Seraphim of Sarov miracle worker arrived to St. Nicholas Church in Oxford. Earlier, they were brought to London from the famous Russian monastery of Diveyevo, the Sourozh Diocese of Moscow Patriarchate reports. Upon arrival to the church in Oxford, a prayer was served in front of relics with a large confluence of Orthodox believers in the city. During the visit, the delegation attended the grave of Archimandrite Nikolay (Gibbs), an English teacher of the Passion-Bearer Tsesarevich Alexy. In the evening, Archpriest Maxim Nikolsky from the Dormition Cathedral in London, presented the translation into English of the book by the holy martyr Archimandrite Seraphim (Chichagov) Chronicle of the Seraphimo-Diveyevsky Monastery.